Print out Paper Airplanes with a cute airmail border. These make great classroom valentines for kids or for your special someone. Have you seen the adorable short video called Paper Man by Disney? It’s really sweet…so simple and romantic! 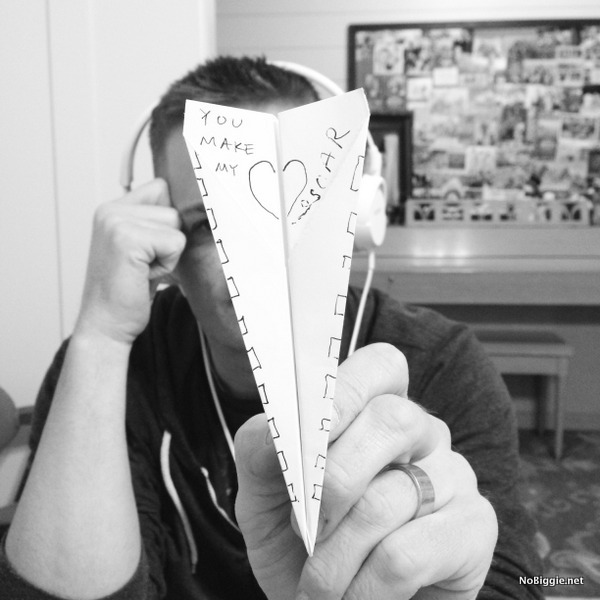 This little paper airplane printable was inspired by that cute short video. Now whenever I see paper airplanes, I see them in a new way…so romantic! With the help of my awesome husband Kyle, we’ve created a double sided paper airplane that reads: “You make my heart SOAR”. It has a place to write your child’s name (or your name) and the name of a classmate on the other side. This would also be a fun Valentine for a boy to take to school because it has no pink on it…plus it’s like a toy! Here’s a short How-To video to show you how to fold it up. Once you have it printed on both sides, you will get 4 paper airplanes out of one sheet. If there are 25 kids in your child’s classroom, you will print out 6 sheets to equal 24 + 1 extra. I know a lot of moms who like the idea of non-candy Valentines at school since there is always so much candy. Well this paper airplane doubles as “the toy” and the Valentine in one! PLEASE NOTE: If the fold lines don’t match up when you print the PDF, make sure you change the print option from ‘Actual Size’ to ‘Fit’ or ‘Fit to Size’ in the print dialogue box. This printable paper airplane Valentine is being offered as a two dollar download. For $2 you can download and then print it as many times as you’d like. *Please Note: a direct download link for this printable file will be sent to the email account of your choosing when you complete your purchase. After your purchase is complete, you will be redirected to a confirmation page that will also have a direct link to the download. If you have any questions or concerns, please email admin @ nobiggie .net. Thank you! I’ve paid for the paper airplane download, but I can’t access it. Will you help me find it, please? Thanks! Hi Kim! I will send it to you via email. Sorry for the confusion. Sometimes it gets sent to your junk or spam folders. Thank you for your purchase! I have sent it via email. Thank you for your purchase! I too have the same problem. I purchased it but cannot access it. Please help. Just sent! Sorry for the delay. Thanks for your purchase! It often times is found in Spam and Junk Folders. What a fantastic idea, Kami. My son and daughter are huge aviation fans and immediately fell for this idea. I just paid. buy now lot working . It just takes you to paypal but doesnt process anything. What am I doing wrong? I log into paypal but there is no connection to your site. Just sent you the printable. Thanks for your purchase! Just sent! Thanks for your purchase! Same issue, the buy now button just takes you to paypal login, but nothing to transition to pay. Any advice? And how long for the email when purchased? I would like to finalize and do this craft today with the kids. Hi – the Paypal link is sending me to the Paypal website but there is no link or invoice to pay. Once I sign in, I am just receiving a summary of my account history. Would you be able to e-mail me an invoice? having a hard time with the pay pal link. please help! Also had trouble with buy now link. Entered your admin email in pay pal. Please let me know if you do not receive it. Thank you! I really think it is awful to advertise your “FREE PRINTABLE PLANE” then ask for money for it!! Not all parents have a paypal account and can pay for downloads. If you were upfront about it and said DOLLAR DOWNLOAD, that is fine, make a profit but when it is under a headline of free download on multiple sites, that is not fair. Lying about your ” free” product is probably making quite a few children sad as well as parents. Very disappointed! At last I see a light with those power meters… I mean the price I can’t wait to see a review from you about this power meter. The worst part is it won’t connect to my polar rs800cx….another reason for me to abandon polar and move to garmin. Hi, I just purchased, but no link was sent, Will you please send to my email? Just purchased this but I can’t find a link. Wondering how long it takes to get email. I have paid and need these ASAP! Thanks! I paid for this but i haven’t received an email yet. How long does it take? Hi, we just purchased this, when can we expect the e-mail? We are hoping to have this by tonight, so our son can take them to school for Valentines tomorrow. I actually wasn’t able to receive it, it might be that my e-mail is full. Could you please send it to this e-mail instead? I paid this evening. Waiting for the email. Thanks. Did anyone receive theirs today? I just made the purchase but didn’t realize it would take 24 hours….need it for school tomorrow. I purchased mine on Sunday, and mine came within minutes… maybe check your junk mail? Still haven’t received it. Any luck with you? Hi Kevin! So sorry for the delay. All purchased PDF files have been sent. Thanks for your purchase. If it is coming to you too late, we are happy to refund you the one dollar. Again we apologize for the delay. So sorry for the delay -we just sent the PDF file. I didn’t realize that non-verified PayPal purchases default to 24 hours. I have now changed that setting. Sorry I didn’t realize the delivery was delayed in those instances. If you didn’t get the PDF in time, please let me know and I’ll refund your purchase. Thanks! I see others are having issues receiving the document, however I thought I’d let you know I received mine right away. Really need this by tonight. Already paid through Pay Pal! Hello! I, too, paid and am waiting for the link – and need tonight! If this indeed takes hours to get the link, that should be made clear ahead of time! Please advise or send the link to download asap. Thanks. I am having trouble getting two of your printable valentines that I paid for.Its the paper airplane one and the watercolor paint one. What am I missing? It gave me confirmation after I paid. They have both been sent. Let me know if you have any issues. Thanks! I just paid the $1 fee for the free printable with paypal and got a receipt. Please send the file to my email address. My son will LOVE sending these out to his class mates. So I’ve paid my dollar, where is the paper plane download? Hi Doreen! Just sent! Sometimes it gets lost in junk mail or SPAM. Thanks for your purchase! Just sent! Just downloaded the file – so cute! Does this work best with cardstock or plain paper? Hi Sue! Plain paper will fold easier! Can you please send me the link? I paid via pay pal earlier today. Hi Tiffany! We just sent. Thank you for your purchase! Happy Valentine’s Day! I have paid but have not received the download. I also just paid for this but cannot access it anywhere. 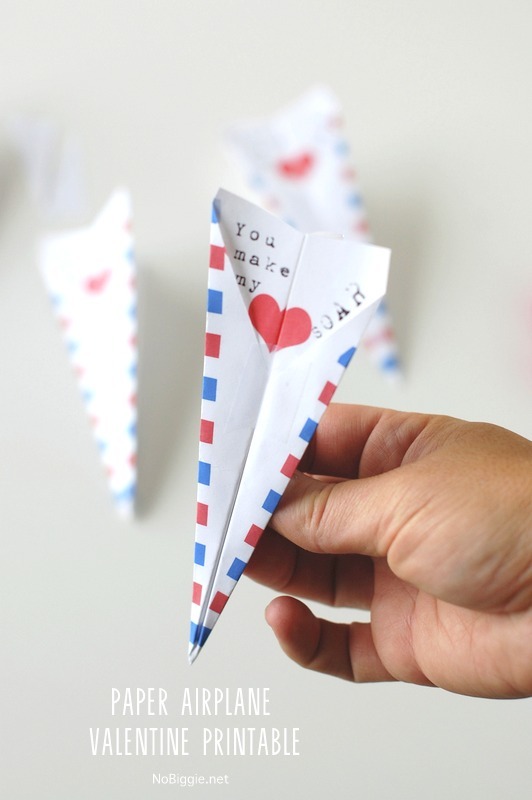 I just purchased the paper airplane…suuuuper cute idea! But my Paypal is under my husband Rob’s email address…can you please send the download to my personal email address with the email you get this commnet from? The receipt is fine to his email…just want the download to mine. Thank you and I look forward to getting it! paypal appears to have went thru – but it did not look/act like most paypal purchases, it seemed a bit wonky – I have not gotten the email with the download link/file and it has been a while. So sorry for the delay! Thank you for your purchase! I’ve was out of town over the weekend and the download has now been sent to you via email. Hi! Just paid on PayPal but no email has come through. I checked my spam folder in case it got caught there. Please email me the link so I can print these AWESOME Valentine’s cards. I purchased the template, but the download is nowhere to be found. I just paid for my valentine on PayPal but didn’t receive a link to the paper airplane valentine– could you please send. Just purchased and do not see in inbox or junk mail folders. Could you please send? please email the link asap! i need it today. Did you get your email? I have been waiting since Saturday. I paid for it on Saturday, is there any chance of the email download getting sent today? I need to work on this tonight as Valentine’s Day is tomorrow. I didn’t realize it would take so long, otherwise I wouldn’t have paid for it. I’m hoping you are getting my messages! 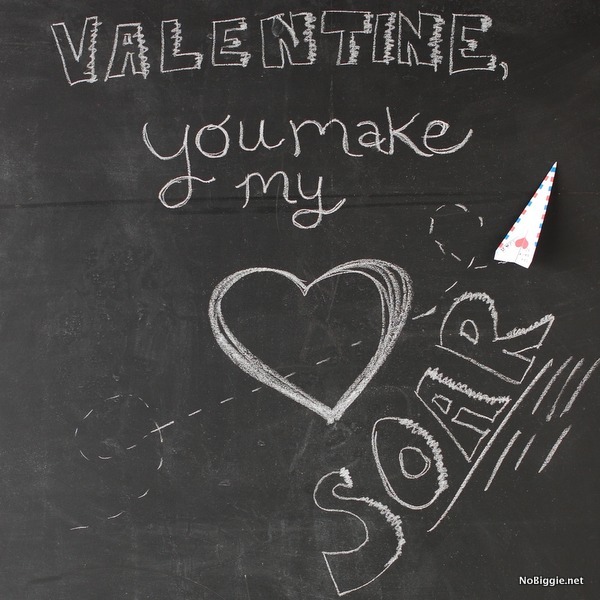 I have also paid for the free printable valentine airplane but was not able to download it. Hi Diane! The download was just now sent via email. Sorry for the confusion! Hi, I recently purchased the paper airplane download, and never received it via email. I just tried to send an email to admin@nobiggie.net but I am not sure it will go through hotmail was claiming it wasn’t the correct format. Anyways, hopefully someone can help! Thank you ! Thank you for your purchase! The download was sent! Please send me instructions for download. Just paid. Thanks. Hi- I sent you payment yesterday for the paper airplanes but have been unable to access. Can you help? File sent! Thank you for your purchase! Hi there. I sent payment and see my card was charged, but I never received the file? I’ve checked my spam as well? I just paid for this download, how long does it take to receive the email with the link for the download? I am a procrastinator and need this ASAP. I thought it’d be an instant download. Thanks! The download has been sent! Thank you for your purchase! these are not lining up. I have wasted 30 sheets trying to calibrate the printer. What settings do I use? I have scaled to print and when I try to get the planes apart…they do NOT line up and I can’t assemble. This is very frustrating…wasting so much paper, time, and INK!! Hi Leticia – we are so sorry for the frustration. I just sent you an email. JUST PAID! HOW DO I DOWNLOAD THIS? I have Paid for the paper airplane but cannot access it and never got an email with the link! Its beyond frustrating. Hi! Sorry I was away from email. Sorry for the delay and the hassle. Thank you for your purchase, the file has been sent! Haven’t received the download for the paper airplane yet.. It would be great if you could automate it, so when someone pays, the download is automatically emailed to them. Hi! Sorry I was away from email. Sorry for the delay. Thank you for your purchase, the file has been sent! didn’t realize this wasn’t an instant download after payment. I was hoping to be able to print this tonight. When should I expect an email? Just sent the file via email. Thanks for your purchase! Happy Valentine’s Day! Wow this is a little silly, you say above that you receive it in an email with your payment and then when reading the comments I’m realizing you email it on your own time? If I don’t receive the download soon I might as well dispute the charge unfortunately since today is Valentines Day and your advertisement is very misleading… Please get back to me soon, Happy Valentine’s Day though! Hi! The majority of the files are received via email with no problem, but unfortunately for some reason a handful are not. Thank you for your patience. The download has been sent via email. I piurchased the valentine airplane printable and I am ALSO NOT ABLE to find it let alone print it. Thank you for your purchase! The file has been sent.